Even better in person than online photos. Soft underfoot, great colors, and good craftsmanship. If you are seeking something different, look no further. Great rug! 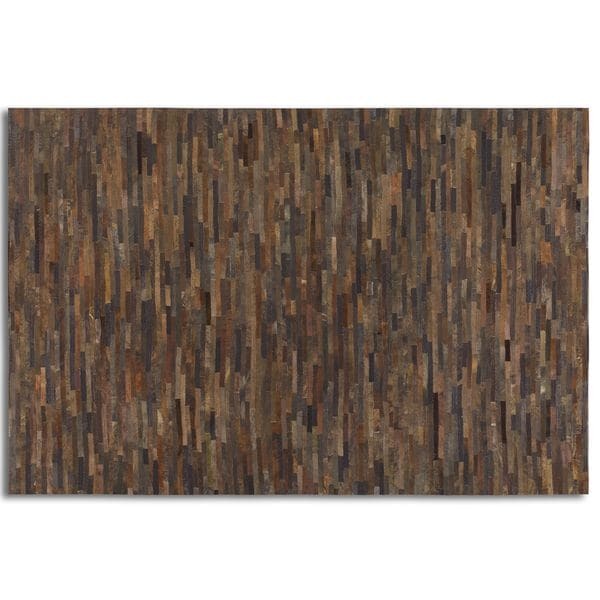 Hand Woven Balbach Leather/Cotton Area Rug - 5' x 7'6"
This Malone suede leather rug utilizes stitched together strips of rescued rust brown leathers. This contemporary styled rug adds an elegant touch to your home decor. "The description says latex and wool, are these errors? If not where are they used in the rug? What is the backing?" Thank you for your question, Mtnhomebody. The Malone Suede Leather Rug (5' x 8') is made from suede/leather. We apologize for the confusion and will have the information corrected. Have a great day.